This article was submitted by Donald E. Holmes. The men and women who work voluntarily in close proximity with pastors in any congregation, regardless of denomination, deserve mention. In this instance they came from Kingston, PEI, and they are limited to five families, so that the character of the church is akin to a large family. The ten deacons in this agrarian community were all men as one might expect from the time period—late nineteenth and early twentieth century. Charles Holmes, born in Froxfield, Wiltshire, England, in 1818, joined the British Army and at an early age, served in India for a time, then went to Canada. He commanded the first regiment to occupy Wellington Barracks, Halifax, at its opening. After discharge from the Army, he settled in East Wiltshire (Kingston) PEI in 1852. 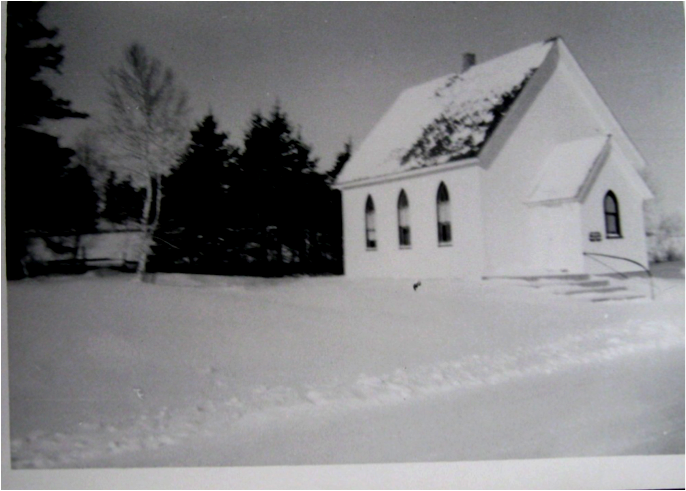 Charles Holmes was 34 years old when he landed on PEI where he farmed and was a very devout Christian who became the first of ten deacons of the Kingston Baptist Church. These were the men who served as deacons in this small wooden, rural church. Charles Holmes, as Deacon of this Baptist Church at Kingston, possessed the “Deacon’s Cane” (an honour held by senior Deacons) for quite a number of years. After his death , it passed out of the family, to Deacons Ward, then Fraser, then to Charles Holmes’ sons William till his death, then to James, who possessed it till moving away to Freetown. The Holmes family can be justly proud of the fact that the father and his two sons, as Senior Deacons, all possessed the “Deacon’s Cane”. The remainder of the story comes from pieces of information I gathered after laborious hours of searching and questioning people who might have known the story, and attempting to find people who once lived in the area and might have been cognizant of details others had forgotten, and because of my age at the time, I had never known. The first deacon of the Church, Captain Charles Holmes, my great-great-grandfather, was in possession of a cane which he took to the Island from England when he was in command of the first regiment to occupy Wellington Barracks in Halifax, Nova Scotia. 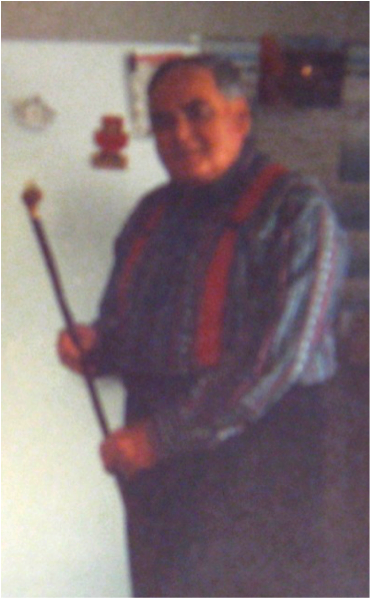 He carried this cane with him most of the time, and Mrs. Susan Newson recalled seeing Grandfather Holmes (as he was known to her and many other people), walking up the hill with the cane. At the time of his death, this cane was passed out of the Holmes family as stated above by Esther Holmes. When James went to live in Freetown, he gave the cane to Stephen Ackland in whose house I found the cane. Strangely, none of Stephen’s four daughters recalled their father possessing such a cane. There was great mystery surrounding the whereabouts of the cane and many of the older people had actually heard of it at one time or another, but none could describe it accurately in detail nor tell me where it was. One evening I went on a search and after many attempts stumbled into the correct place: the house of one of the daughters of Mr. Ackland. Elynor, Mrs. Grant Willis, told me there was a cane lying in one of the old trunks belonging to her father which had never been opened since his death in 1973. She showed me the cane, and from the scattered clues I already had about it, I figured this had to be the one, that cane that had been considered lost for so many years. In reality, the cane was never lost, but its tradition had died out with James Holmes’ move from Hampshire to Freetown, PEI, in the early 1920s. James had the distinction of being a deacon in the North River-Kingston and Freetown-Bedeque Baptist Churches for 65 years. James Holmes had given the cane to Stephen Ackland, but Mr. Ackland chose not to carry the cane to church with him on all occasions as the former deacons had done to symbolize both their authority and friendship. The cane had become purely ornamental; it still is. It is made of cherry wood, likely the trunk of a very young cherry tree because of the evenness of the entire stick, and the top of the cane is carved in teak. 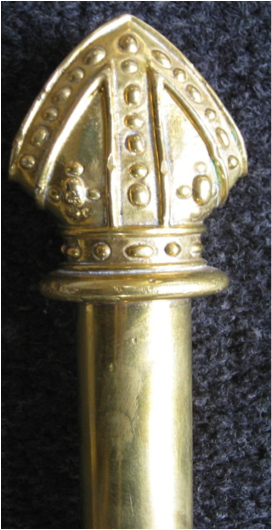 The finial, carved by hand of course, has a dog’s head with two amber eyes, wooden ears, and a brass collar around its neck. The dog’s head signified that man’s best friend was his dog; the brass collar signified the eternal friendship of the ring. As strange as the story about this cane is, and the fact that none of the Ackland girls (Grace Murray, Hilda Murray, Gertrude Willis, nor Elynor Willis), knew anything about it, it is even more odd that Stephen’s wife, Ellen, did not mention it to any of her children. She was a very active church member and knew about this cane. Most peculiarly of all is the fact that she never had the cane passed on to the next senior deacon in line for it. In the photo (above) the Senior Deacon, Stephen Ackland (85 years old), holds the cane as he stands in Long Creek Baptist Church beside the Baptist minister, Rev. Owen D. Cochran and Dr. Rowena Cochran, who is holding flowers, on June 29, 1958, at their retirement from the five-point North River pastoral charge. Deacon Burgess Newson, who was ninety-four at the time I interviewed him told me the following anecdote: “Steve [Ackland] and I were nominated for Deaconship at the same time, and he won by two votes. He got the cane, and I guess likely I’m next in line”. Burgess Newson was elected deacon at a later date and in 1971, when this account was written, he was indeed the senior of the three deacons. 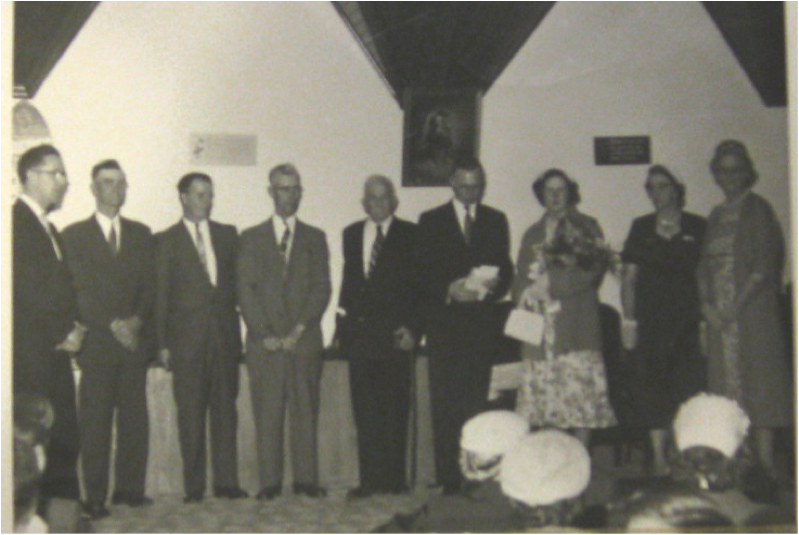 At the 110th Anniversary service of Kingston Baptist Church, on September 5, 1971, the cane was ceremoniously presented by the Rev. Arthur Willis to Deacon Burgess Newson (pictured here). Deacon Newson offered prayer before the completely filled sanctuary. The cane, handed from one generation to the succeeding one of senior deacons is emblematic of the honour of being senior deacon. Seniority is determined by date of appointment to the position of deacon, and secondly, according to age, the older appointee taking the honour if two or more were appointed at the same time. Parker Newson and Milton Ward being the other two in line for the cane respectively, but neither one ever had possession of it. It has been 45 years since that interview. I have no idea where the cane may be today. Do you know where it is? An earlier story written by Donald E. Holmes, Indignant Silence – A Place for Public Worship, was published on this site here. If anyone knows where the cane is now, they can email me, vivian@eastlink.ca and I will pass your message on to Donald Holmes. My heart beat faster when I saw the surname Ward. My ggrandfather, Daniel D. Ward b. 1804, is my brick wall. The bad news is he was W.M. not Baptist. And the rest of the bad news, that was way before the people in this article were born. Unless William? I need something more for that William in order to research him. Interesting read, my daughter currently lives in the old church. She appreciates seeing old pictures of when it was still a church. That’s great to hear, Beryl. I hope your daughter enjoys the story.